VANCOUVER, B.C. - June is Pride Month, and that means more inspiration, inclusion, acceptance and awareness to for the LGBTQ community. The football world is striving to help make a difference with Playing for Pride throughout this month. North Carolina FC goalkeeper Austin da Luz, wanted to try and do something that could involve footballers, while also raising awareness. He teamed up with Athlete Ally to create Playing for Pride. Spread through the powers of social media, several footballers have joined. Playing for Pride has already raised $3,253 for Athlete Ally with 124 players, from 64 teams signed up. RedNation Online caught up with six professional footballers to ask them how they found out about Playing for Pride, and why they are supporting the initiative. How did you find out about Playing for Pride? "I was connected with Austin da Luz who plays in North Carolina with NCFC. He and I went to the same college, not at the same time, but we played at Wake (Forest). I followed him closely, and he got involved with it, and spread the word throughout the game. I just saw an opportunity to want to get involved." What does it mean to you to be a part of the initiative? "June is Pride Month, and I think it's important to not only concentrate just in June. I think it's a chance as a player to use your platform for something that's greater than the game. I think it's just a chance to allow people to feel included. I think as human beings, it's not really our place to judge, or be negative towards an attitude, or a lifestyle that someone has. I've just decided to take it on, using my social media or whatever it is, to spread a positive word of inclusion, of acceptedness. Being able to be involved is something that I take a lot of pride in." 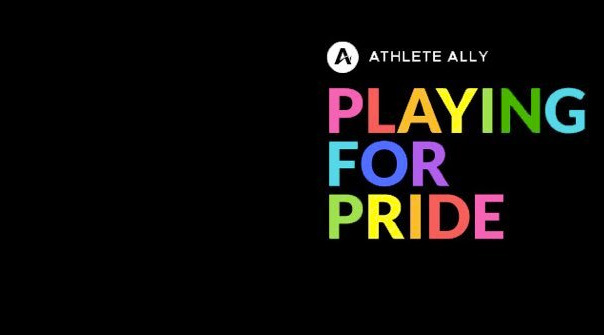 How is Playing for Pride helping raise awareness for Athlete Ally? "The soccer world is so small, you just see people connected, and involved in the initiative. Guys are raising money around the league. I don't necessarily think only raising money is the key to this, but it's just getting attention. Whether it's just a fan or a fellow player involved, and having them feel comfortable being accepted for who they are, and just being confident in who they are as a person." Do you think we are getting closer to seeing another out player in MLS? "I think Robbie's story is pretty inspirational. It was cool to see, and it was cool to play against him. It took a lot of bravery, and it took a lot of courage to do what he did. I think he opened the door for more openly gay players to be accepted and to feel comfortable being out, and being a professional athlete. Players can make a difference, it's not just about performing on the field, but it's about making a statement, and being together for something that is bigger than the game." "One of my best friends, Robbie Rogers is gay. I'm very close with him, so I'm very supportive of the LGBTQ community." You rented out an Orlando theatre to show Love Simon, what was behind doing that? "Robbie's husband directed the film, and we really liked the film. We wanted as many people to see it as possible. We thought it would be a nice way to introduce ourselves to the community, and do something nice for some people who normally wouldn't have gone to see the movie. The movie had a great message, and we just wanted to spread the word." "They released the tickets around 11:00 am and I was told by 11:15 am it was sold out. That was pretty cool. A couple of guys from the team came with me to watch the movie that night. It was nice to see some Orlando City fans, and meet some people. It was fun." "We just want to show that our sport, soccer is for everybody. We're open and welcome to people of all orientations that come from all walks of life. I've been fortunate to travel the world and meet people from different countries, and different backgrounds. Soccer has been very open to me, and I hope that it will be open to everybody else." "I have no idea. I thought there would be another one by now. We'll see. I hope that whoever it is, has the courage to come out, because I think they'll be supported by the soccer community." "It's awesome. I love being a part of a league that treats everybody equally. They're so invested in doing those things. Kay Rawlins put me in touch with Austin da Luz who I've had connections with over the years. He's just doing something awesome. Whenever you get a chance like that to pull your weight, and get some of the guys on board. It's important you take advantage of that. Over the years, I've come to learn, and see just how deep of an impact that has on the communities around North America. Ultimately that's what this is all about." It's a great cause and hope you match as well. "It means a lot, it's a great program, great initiative. I think Austin's doing a great job of doing this, and I think that the people that are helping out, it means a lot. I'm hoping that more do. I'm just proud to be even mentioned with those names." "I think that, that's a good thing. Just to get that out there. The more you get out there, and just talk about it, and realize how great an opportunity it really is, it helps everyone." "Yeah, I hope so. I've always been a strong believer of 'If You Can Play, You Can Play'. It doesn't matter who you are, background, heritage, anything. It's eleven out there, and I think that's the great thing about the sport. You've got to come together, and don't cross the line." "I think I just saw it on social media. When I looked at who was involved, I saw Diana Matheson, and a friend from Duke was involved. It was a no brainer to get involved in the cause. I work with Athlete Ally as well. I helped run it at Duke, so that's a place close to my heart." "Athlete Ally, they're working on a bunch of things across the board. I think with me specifically, it was working that intercollegiate level. For that it was varsity athletics at Duke. There's not Athlete Ally setup at many schools, and I think for Duke it was huge for us to raise awareness. Whether that's homophobia, transphobia, all of those issues around our campus specifically. The money that I want it to go towards it, is setting that up at other colleges." "I have a teammate with Utah Royals FC, who had told our team about it. Katie Stengel. She was involved in Playing for Pride, so a few of our team members got involved with that great initiative." "I think I said, every game is $5, every assist $5, and every goal is $5 donated to Playing for Pride for the month of June. I'm asking anyone who wants to match that? "It's a great cause. I think the NWSL has been a great advocate, an ally, so I'm just happy to be a part of the program this year." Notes: To make a donation or to find out more about Playing for Pride please visit - https://app.mobilecause.com/vf/PLAY4PRIDE/usm.